How does science work? Though romanticized as a string of exciting, accidental discoveries, in reality, the bulk of scientific research happens in the prelude to discovery–the humbler, though no less exciting, process of troubleshooting. The first day of an expedition is typically the most hectic, as researchers settle into the rhythm of fieldwork, smoothing out the kinks along the way. The Surprise Valley team encountered its fair share of issues to troubleshoot today. The first day of the field season began at 6:30 AM this morning, with the team members loading the equipment and driving to nearby Cedarville Airport. There, they would send SIERRA, a small aircraft capable of flying without pilot or crew, known as an unmanned aerial system (UAS), on its first flight mission to collect magnetic data along a preprogrammed course using an instrument called a magnetometer. The team will use this data to map the underground faults and fractures in Surprise Valley, which may help circulate hot water and minerals throughout the numerous hot springs in the area. This information will be critical for predicting the likelihood of earthquakes in the region and the damage they may do, informing land and water use decisions, and tapping the hot spring fluids as an energy resource. When USGS arrived at the airport, SIERRA engineers and aircraft itself awaited them, as did Corey Ippolito and Ritchie Lee, both from NASA Ames Research Center, who developed the scientific instrumentation, or payload, which SIERRA uses to collect magnetic data. The team will integrate the payload into a new experimental UAS next year which can make higher-level cognitive assessments of the sensor data it receives, allowing it to plan and perform a complete survey mission without human intervention. The vehicle will adjust its flight path according to magnetic fields and environmental conditions in order to maximize data collection in areas of interest and reduce flight time over other areas. With a specified pre-programmed flight path that does not adapt to the magnetic environment, SIERRA could miss important features that will not be apparent until after the data is downloaded post-flight. The team will later compare the datasets collected by the two systems with the goal of developing a cheaper, more effective airborne survey system. Both groups of engineers had already set up the ground base station, where they would communicate with SIERRA through signals relayed from the aircraft to their computers. At about 9:00 AM, SIERRA’s engine rumbled to life, its propeller whirring vigorously. Just as fast as it sped down the runway, it was aloft, disappearing into a tiny glint of sunlight above the hills along the eastern edge of the valley. 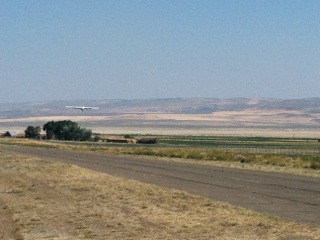 A pilot in a separate aircraft, the chase plane, took off after the SIERRA, which he would monitor throughout its flight per Federal Aviation Administration regulations. SIERRA began by flying north, south, east, and west in a box-shaped path. It then flew within the box, first undulating up and down, then banking to the left and right, in a flight sequence known as a compensation box. An instrument on SIERRA called a fluxgate magnetometer would provide information about the magnetic field at every possible position of the aircraft, known as compensation data. 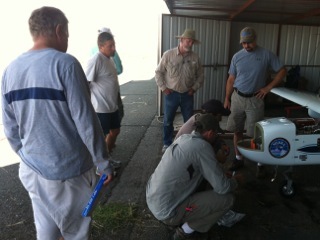 When the team performs a magnetic survey, they can subtract the appropriate magnetic field values based on SIERRA’s position at any given point in time. This would allow researchers to correct for variations in the magnetic field that can arise when SIERRA maneuvers, which could obscure signals generated by the geologic structures the scientists are interested in. Unlike the cesium magnetometer in the wingtip, which tells researchers only the strength of the field, the fluxgate also indicates the direction of the field, parsed into three different axes. The aircraft then began a detailed survey, collecting magnetic field data along tightly spaced east-west lines from two of the three regions that Jonathan Glen of the U.S. Geological Survey (USGS) and Anne Egger of Central Washington University, the lead geoscientists on the project, had found magnetically interesting according to ground-based studies they performed during a previous visit to Surprise Valley. Meanwhile, the SIERRA ground crew monitored how the aircraft moved through the air based on magnetic field direction data collected by another type of fluxgate magnetometer, relayed from an antenna installed on the aircraft’s underbelly. SIERRA also sent information on its flight parameters, such as its altitude, GPS coordinates, and speed. At the same time, the USGS and NASA engineers’ computers received the scientific data SIERRA collected in addition to flight parameter data, transmitted by an antenna on the nose of the aircraft. Besides the compensation data, these include the magnetic field data measured by SIERRA’s magnetometer, as well as the UAS’ distance from the ground, collected by an instrument called a laser altimeter. Knowing SIERRA’s altitude will allow the team to correct for variations in magnetic field strength due merely to differences in distance from a magnetic source, since the strength of a magnetic field fades the further one moves away from the source. Out in the field, SIERRA relayed the same flight parameter and magnetic data it relayed to the science payload team to an ATV equipped with a computer, GPS, and a radio receiver. SIERRA transmits payload data to the radio receiver, which is then stored on a hard drive on the ATV. This ensures that the team has a backup in case the computer on board the SIERRA fails or the aircraft crashes. Since following SIERRA’s exact path is unfeasible on ATVs, a researcher in Jonathan’s lab drove along a north-south path, perpendicular to SIERRA’s flight path, which allowed the ATV to remain within range of the aircraft at all times. After SIERRA landed, the wireless communication system that the payload engineers had set up to download flight parameter and magnetic data from SIERRA malfunctioned. In the past they had discussed transferring data directly from SIERRA through a network cable, although in the end they opted to use a commercial off-the-shelf (COTS) wireless system, or a wireless system available for sale to the general public. COTS products are designed to be easily implemented into existing systems without the need for customization. With the wireless system, the engineers could avoid directly accessing the aircraft’s sensitive instruments. However, the COTS system was not able to withstand SIERRA’s vibrations during the flight test. With the wireless system down, the payload team developed a workaround that requires the aircraft to be physically tethered to the ground station to download the data after each flight. Meanwhile, the compensation data from SIERRA’s fluxgate magnetometer yielded highly unusual results. The data from a test of the fluxgate when it was first installed looked reasonable to the team, with variations not too far from expected values. They did notice some anomalies, which they believed they could solve only by recalibrating the instrument or remounting it away from magnetic noise, signals from magnetic sources that may distort the magnetometer’s measurements, called magnetic noise. Currently the fluxgate sits beneath the wing, not at the tip, but toward the center of the aircraft, which houses numerous electronics. Both recalibrating and repositioning the fluxgate would be prohibitively expensive. Instead, the researchers decided to use the instrument as it was calibrated. The compensation still corrected for SIERRA’s magnetic field, but not as precisely as it should. The researchers hoped that the remoteness of Surprise Valley, away from steel-framed buildings, electric lines, and other magnetic sources would enable them to make minor adjustments to correct for aircraft-related noise. At the end of the day, the payload systems engineers hauled the base station computers to the USGS group’s house, where they spent hours poring over the compensation data, trying to pinpoint the source of the anomalies. Then an idea occurred to the team: maybe the problem was limited only to the fluxgate and not dependent on the aircraft, which they could confirm by examining just the fluxgate in the house, where magnetic noise is minimal. If working properly, the fluxgate’s measurements should closely reflect the Earth’s magnetic field, a known value. If they don’t, then the problem must be due to the fluxgate itself. Jonathan and Corey called SIERRA lead engineer Randy Berthold to ask if one of the SIERRA engineers could remove the fluxgate magnetometer from the aircraft so that they could run the test on the software and hardware in isolation. Once Randy agreed to meet them at the Cedarville Airport in a few minutes, past eight at night, Jonathan, Corey, Ritchie, and Geometrics engineer Misha Tchernychev bolted out of the house, jumped into one of the trucks, and sped to the airport. There, Randy and another SIERRA engineer, Ric Kolyer removed the fluxgate, which the USGS, NASA, and Geometrics crew then took home for a long night of troubleshooting. 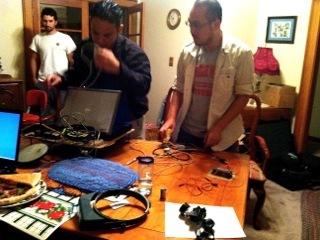 Right: Corey (left) and Ritchie (right) troubleshooting the fluxgate magnetometer. Team members camped out with the fluxgate in the dining room, exhausted yet still talking and joking animatedly between swills of coffee. After a few hours, the team discovered that the fluxgate could collect data in two modes—calibrated or raw. The fluxgate was currently, as during the flight, in calibrated mode. When they team took measurements in this mode, they saw magnetic field values far from those of the Earth. When they switched the instrument to raw mode, they saw the values they expected. Clearly the fluxgate’s calibration needed fixing. Tomorrow morning, the crew will try to determine the correct calibration themselves by moving the fluxgate through different maneuvers, which will yield the mathematical relationship between the raw and improperly calibrated versions of the data, allowing them to convert today’s data to raw data. They hope that a technician from Applied Physics, the manufacturer of the fluxgate, during tomorrow’s Labor Day holiday, in which case they can provide the proper calibration, another equation that the team can apply to the raw data from today to generate properly calibrated results. 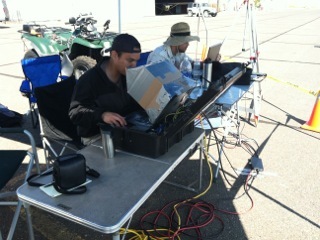 Otherwise, the team can calculate the correct calibration themselves based on the readings from the fluxgate maneuvers. Ideally, the technician may even be able to drive a new instrument up from the Bay Area so that the team can avoid having to undo and redo the calibration for each dataset. “Field work can be very stressful,” said Jonathan. “It requires a certain kind of temperament. I’ve learned to live on very little sleep.” He paused, then grinned. “But that’s the best part of fieldwork. I’m so thrilled to get to work with Corey and Ritchie. They’re really great…. We’re really privileged to be able to do the work we do.” What he said was true, even when “the work” is troubleshooting. Imagine how much more so on a day of smooth operation.